October chat between Stephen Simmons and his co-performer Dave Coleman this evening brought up the topic of some of the Halloween traditions back home, with Stephen particularly commenting on how he is often touring Europe during this time of year. In a slight twist of irony, it was October 31st 2014 when I first saw Stephen Simmons play live and thus extending the musical appreciation that initially surfaced when reviewing the HEARSAY album released around then. At the time, he was establishing a fan base in the Staffordshire area and always pays the county a visit when trips are made from his Tennessee home to continue a mission of sharing music with European audiences. Since that Halloween evening four years ago, Stephen has played an annual show in Elford, either in a house concert or marquee garden format, cementing relationships formed and frequently bringing new music. The 2018 renewal saw a couple of innovations. Stephen usually tours the UK alone, although Molly Jewell, a fellow Nashville musician, joined him a couple of years back. The time the co-operation expanded into a fuller presentation, with long-term musical companion Dave Coleman playing electric guitar throughout as well as chipping in with a few solo songs prior to each of Stephen’s sets commencing. On the new music front, Stephen released an album this summer titled GALL. Unfortunately, for lovers of physical copies mainly, the album is only available digitally, but quite often artists hamstrung by financial constraints have to make rational decisions. There is already a considerable Stephen Simmons back catalogue in place, including many long-term favourite songs frequently making his sets, and the good news is that further new music is in motion that hopefully will get an expanded release. You can never restrain a prolific singer-songwriter bursting with new ideas. Anyhow, for those of you open to feasting on digital music the new album is a wise and valuable investment. A link to the Band Camp site is placed below but it is also available on the mainstream sites for streaming or downloading on both sides of the pond. GALL is probably Stephen’s most stripped back and personal set of songs for a while. The process is purely a one-person operation and the recording took place in his vacant grandparents’ house away from the big city in small town Tennessee. With this album not really being subject to the big sell, only a couple of songs had an outing during this evening’s house concert. ‘Burnt Orange & Bruised Purple’ and ‘Death to the Dreamers’ are among the leading songs on the eleven-track record and sounded good in a live unfiltered setting, akin to what you get on the album in reality. The location and the family orientated content interweave coherently with perhaps the strongest song to feature being the title number ‘Gall’. You never know, in the future some of these songs may re-surface on another album. Alternatively, this project may always remain self-contained. 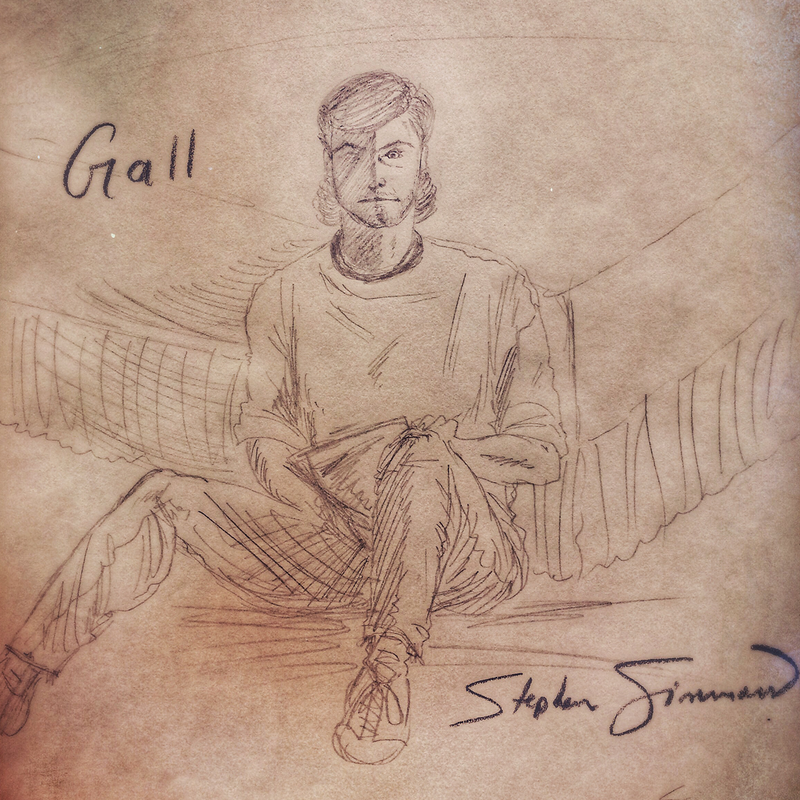 Either way, GALL is worth checking out especially if you have come across Stephen’s work before and are partial to high quality singer-songwriting with a southern flavour. Back to this evening’s show and the impact made by the presence of Dave Coleman. Getting the electric guitar sound spot on in an informal dining room setting is tricky, but this was accomplished by a player with vast experience as a producer and founder of the Nashville-based rock ‘n’ roll roots band The Coal Men. Dave introduced a couple of his songs including the track ‘Singer (In Louisville)’ featured here. With murder ballads being a theme of the evening, Dave could not resist sharing a version of ‘Long Black Veil’. When supporting Stephen, he skillful added the appropriate riffs and required twang, probably letting loose the most when they covered Springsteen’s ‘Tougher Than the Rest’. The Coal Men’s records are readily available digitally and can possibly be tracked down on a CD. Dave had copies of 2016’s PUSHED TO THE SIDE and the 2013 release ESCALATOR for sale and if you like your roots music with a little tempo and rhythm alongside some nifty guitar work they will be right up your street. The presence of the electric guitar did ensure Stephen had to make some vocal adjustment to his sound. This smoothly occurred for a bunch of songs stretching back well over ten years or more to sound as sweet as ever. You never know quite what you are going to get from a Stephen Simmons set list, but with a fresh range of stories, the content is normally top notch. This evening it was older tracks like ‘Asheville Girl’ (probably the standout moment from the show), ‘Lay on the Tracks’ and ‘Parchcorn Falls’ that crept up the appreciation scale. It is also good to hear ‘Horse Cave Kentucky’ especially after visiting this self-generating tourist attraction on a Southern states road trip in 2016. Stephen was his normal unassuming self, grateful that folks turn up to listen to his songs, and fully embracing the culture of being a word junkie. He is humble enough to continue to want to write better songs and will probably never cease to until the guitar, pen and notepad are packed away. A slice of southern culture is exported around the world when he leaves his Nashville home and whether he is viewed as country, folk, singer-songwriter or Americana, he simply, as his compatriots often say, is ‘just a dude who likes to write, play and sing songs’. The house concert environment is the perfect setting for Stephen Simmons to hone his craft. Maintaining this level of intimacy alongside striving to pursue other live music opportunities is a fulfilling place to be. The blessing is a combined moment of pleasure. The privilege to listen and to play is simultaneous. The part Stephen Simmons plays in small corners of the UK live music scene is not insignificant and likely to be successfully around for a few years yet.